It has been 50 years since the world’s most famous nanny first appeared on screen clutching her parrot umbrella and carpet bag. The Disney magical film, Mary Poppins, was released in 1964 and to mark its anniversary, a new range of bags have been released. 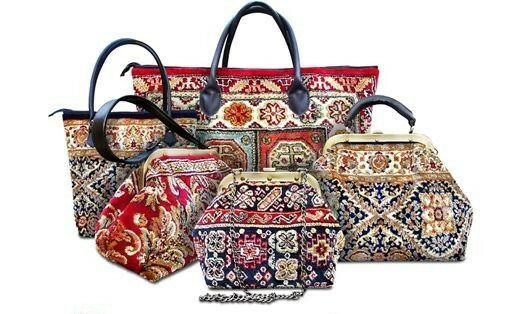 While these spacious carpet bags from www.madeofcarpet.com can’t claim to be bottomless, the colourful designs made from authentic oriental rugs bring back nanny fashion in the most delightful way. With a range of weekend bags, Gladstone bags, tote bags and clutch handbags giving a modern twist to this vintage style, Poppins fans and fashionistas will love this collection. While the original carpet bag prop from the film recently sold at auction for more than £65,000, Made of Carpet bags are much more affordable, costing from £29.95 to £199.95. Made of Carpet bags come with two inside pockets; one zipped, and have a black, silky lining. Created from Western European woven carpet with traditional Oriental patterns, the finish is plush, soft and silky, with a deep pile that gives firmness and a full-bodied look and feel which is true to the high quality bags of the Victorian era. Durable, rainproof and easy to care for, the bags can be treated with foam carpet cleaner or dry-cleaned.